A blast of winter weather helped Colorado ski resorts get back on track with snowmaking efforts Sunday night and Monday, with cooler temperatures expected to linger through Tuesday. However, last week’s warm weather has kept Loveland Ski Area from opening closer to its traditional mid-October date. Arapahoe Basin remains the only open ski area in the state with very limited terrain available, and Copper Mountain and Keystone are scheduled to open Friday. 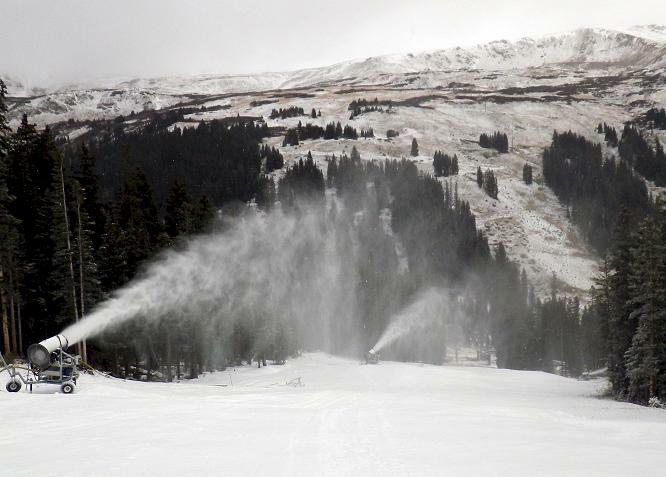 Snowmaking back on track at Loveland. “After a week of record highs, the cold temperatures have returned to the high country along with a little bit of snow,” Loveland officials reported on the resort’s website on Monday. “The snowmakers got back to work last night and as of 10 a.m., the snow guns were still producing snow on the bottom half of the hill. A-Basin COO Alan Henceroth said Sunday and Monday’s weather was a big boost. “Now this is what we have been waiting for,” he wrote on his blog on Monday. “It is snowing and the snowmaking system is cranking. The ambient temperature at Midway is 23 F and falling. Perfect. We expect to make snow all day, all night, and maybe the same again tomorrow. Meteorologist Joel Gratz of Opensnow.com said things will clear out quickly. That’s good news for ski-racing fans welcoming home the U.S. Ski Team from World Cup action over the weekend. Copper Mountain will host the team at its speed center, with training slated to start opening weekend. As Eagle-Vail’s Mikaela Shiffrin won her 10th career World Cup event in Soelden, Austria, on Saturday (her first ever GS victory), ski-racing officials celebrated the countdown to 100 days until the opening of the Feb. 2-15 FIS Alpine World Ski Championships in Vail/Beaver Creek.